The BGP table will be examined and verified more frequently. The BGP table will be modified more quickly in the event that a next-hop address becomes unreachable. The CPU load of the router will increase. To configure scanning intervals of Border Gateway Protocol (BGP) routers for next hop validation or to decrease import processing time of Virtual Private Network version 4 (VPNv4) routing information, use the bgp scan-time command in address family or router configuration mode. To return the scanning interval of a router to its default scanning interval of 60 seconds, use the no form of this command. import = (Optional) Configures import processing of VPNv4 unicast routing information from BGP routers into routing tables. scanner-interval = The scanning interval of BGP routing information. Valid values are from 15 to 60 seconds. The default is 60 seconds. On Cisco IOS-XR, BGP speaker process can be distributed into multiple instances. Cisco IOS XR allows you to control the configuration of the number of distributed speakers and enables you to selectively assign neighbors to specific speakers. On the CRS-1 platform, multiple speaker processes up to 15 may be configured. However, configuring all the different speakers on the primary route processor simply adds to the load on the single RP. Distributed speaker functionality is useful if Distributed Route Processor (DRP) hardware is available to take advantage of process placement. In addition to the speaker process, BPM starts the bRIB process once BGP is configured. bRIB process is responsible for performing the best-path calculation based on partial best paths received from the speaker processes. The best route is installed into the bRIB and is advertised back to all speakers. The bRIB process is also responsible for installing routes in the RIB and for handling routes redistributed from the RIB. the signaling router for implementing source-based RTBH filtering. The maximum-prefix 10 configuration should be configured under the af-group abc instead of the neighbor-group efg. The passall route policy is wrong. interface that is on the reverse path back to the source. RPF is a fundamental concept in multicast routing that enables routers to correctly forward multicast traffic down the distribution tree. RPF makes use of the existing unicast routing table to determine the upstream and downstream neighbors. A router will only forward a multicast packet if it is received on the upstream interface. This RPF check helps to guarantee that the distribution tree will be loop free. The [ ] indicates the configuration was not inherited from a group. - Use the configuration option to display the effective configuration for the neighbor, including any settings that have been inherited from session groups, neighbor groups, or af-groups used by this neighbor. - Use the inheritance option to display the session groups, neighbor groups, and af-group from which this neighbor inherits configuration settings. Noncongruent unicast and multicast topologies can be supported using multiprotocol BGP. Use MSDP to enable the RPs from different domains to exchange information about active multicast sources. domains. MSDP is an elegant way to solve this problem. MSDP is a mechanism that allows RPs to share information about active sources. domains, but it does enable RPs to forward traffic between domains. PIM-SM is used to forward the traffic between the multicast domains. receiving peer using a modified RPF check, until the SA reaches every MSDP router in the interconnected networks - theoretically the entire multicast internet. If the receiving MSDP peer is an RP, and the RP has a (*, G) entry for the group in the SA (there is an interested receiver), the RP creates (S, G) state for the source and joins to the shortest path tree for the source. The encapsulated data is decapsulated and forwarded down the shared tree of that RP. When the packet is received by the last hop router of the receiver, the last hop router also may join the shortest path tree to the source. The MSDP speaker periodically sends SAs that include all sources within the own domain of the RP. Multiprotocol BGP is an enhanced BGP that carries routing information for multiple network layer protocols and IP multicast routes. BGP carries two sets of routes, one set for unicast routing and one set for multicast routing. The routes associated with multicast routing are used by the Protocol Independent Multicast (PIM) feature to build data distribution trees. Multiprotocol BGP is useful when you want a link dedicated to multicast traffic, perhaps to limit which resources are used for which traffic. Multiprotocol BGP allows you to have a unicast routing topology different from a multicast routing topology providing more control over your network and resources. In BGP, the only way to perform interdomain multicast routing was to use the BGP infrastructure that was in place for unicast routing. Perhaps you want all multicast traffic exchanged at one network access point (NAP). If those routers were not multicast capable, or there were differing policies for which you wanted multicast traffic to flow, multicast routing could not be supported without multiprotocol BGP. Note It is possible to configure BGP peers that exchange both unicast and multicast network layer reachability information (NLRI), but you cannot connect multiprotocol BGP clouds with a BGP cloud. That is, you cannot redistribute multiprotocol BGP routes into BGP. Illustrates simple unicast and multicast topoligies that are incongruent, and therefore are not possible without multiprotocol BGP. Autonomous systems 100, 200, and 300 are each connected to two NAPs that are FDDI rings. One is used for unicast peering (and therefore the exchange of unicast traffic). The Multicast Friendly Interconnect (MFI) ring is used for multicast peering (and therefore the exchange of multicast traffic). Each router is unicast and multicast capable. Is a topology of unicast-only routers and multicast-only routers. The two routers on the left are unicast-only routers (that is, they do not support or are not configured to perform multicast routing). The two routers on the right are multicast-only routers. Router A and B support both unicast and multicast routing. The unicast-only and multicast-only routers are connected to a single NAP. Only unicast traffic can travel from Router A to the unicast routers to Router B and back. Multicast traffic could not flow on that path, so another routing table is required. 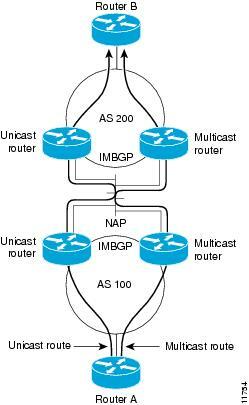 Multicast traffic uses the path from Router A to the multicast routers to Router B and back. Illustrates a multiprotocol BGP environment with a separate unicast route and multicast route from Router A to Router B. Multiprotocol BGP allows these routes to be incongruent. Both of the autonomous systems must be configured for internal multiprotocol BGP (IMBGP) in the figure. A multicast routing protocol, such as PIM, uses the multicast BGP database to perform Reverse Path Forwarding (RPF) lookups for multicast-capable sources. Thus, packets can be sent and accepted on the multicast topology but not on the unicast topology. The 224.192.16.1 multicast IP address maps to 01-00-5E-40-10-01 multicast MAC address. The Cisco IOS-XR configuration command will globally enable PIM and IGMP and MLD multicast processes on the router. When you issue the multicast-routing ipv4 or multicast-routing ipv6 command, all default multicast components (PIM, IGMP, MLD, MFWD, and MRIB) are automatically started, and the CLI prompt changes to "config-mcast-ipv4" or "config-mcast-ipv6", indicating that you have entered multicast-routing configuration submode. A customer would like to connect to a service provider. Redundancy and flexibility is requirements should be considered before deciding on a type of connectivity. BGP and static routing is routing options could be used when connecting a customer to a service provider. Dual-attached customer, PA address space, BGP routing, and private AS number and multihomed customer, PI address space, BGP routing, and public AS number is combinations are recommended when connecting a customer to a service provider. Customer networks that can be summarized in a service provider network should be tagged with no-export BGP community when redistributed into BGP. You are a customer connected to a single service provider with two permanent links. You would like to achieve primary and backup traffic distribution. MED for incoming traffic and local preference for outgoing traffic is BGP attributes which you have to manipulate. You are a customer connected to two service providers with one link to each provider. You would like to achieve primary and backup traffic distribution. AS path for incoming traffic and local preference for outgoing traffic is BGP attributes which you have to manipulate. IS-IS as IGP inside the service provider core network and IBGP between BGP speakers inside the service provider network are routing protocols might be used in a typical service provider network. There is no need to include access links between customers and the service provider in IGP. Private IPv4 addresses on core links and loopback interfaces with MPLS switching, public IPv4 addresses on core links and loopback interfaces, and link-local IPv6 addresses on core links and public IPv6 addresses on loopback interfaces are options can be used to scale IP addressing in service provider networks. Cluster-ID list BGP attribute and originator-ID list BGP attribute are mechanisms used to prevent routing loops in networks with redundant route reflectors. 1. Divide the AS into clusters and designate route reflectors. 2. Configure a cluster ID on route reflectors. 3. Configure clients on route reflectors. 4. On clients, retain only IBGP sessions with route reflectors are the steps that needed to migrate a network to a route reflector - based design into the correct sequence. update-source and ebgp-multihop are Cisco IOS XR Software commands needed to establish an intraconfederation EBGP session between loopback interfaces. allowing the RPs to build interdomain multicast distribution trees. Multicast Source Discovery Protocol (MSDP) is a mechanism to connect multiple PIM sparse-mode domains. MSDP allows multicast sources for a group to be known to all rendezvous point(s) (RPs) in different domains. Each PIM-SM domain uses its own RPs and need not depend on RPs in other domains. An RP in a PIM-SM domain has MSDP peering relationships with MSDP - enabled routers in other domains. Each peering relationship occurs over a TCP connection, which is maintained by the underlying routing system. It avoids inconsistent, manual RP configurations that might cause connectivity problems. routers as candidate RPs so that they can announce their interest in operating as an RP for certain group ranges. determine which RP to use for the groups they support. CISCO-RP-ANNOUNCE multicast group (224.0.1.39), use the auto-rp candidate-rp command in PIM configuratiion mode. To return to the default behavior, use the no form of this command. BGP security and optimization options are used in the core and IP edge portions of the service provider network. Some options are used on the customer edge devices, as well. BGP relies on TCP as its transport protocol. BGP is susceptible to the same attacks that apply to any TCP-based protocol (DoS attacks). BGP is the most frequently targeted routing protocol, since it is used across the Internet. Service providers should take extreme caution to mitigate risks of exploiting BGP routing protocol. Inadvertent mistakes during BGP configuration can be serious and can have worldwide consequences. Such attacks can cause collateral damage to the infrastructure of the service provider, due to large amounts of traffic. Countermeasures should be taken to prevent damage to the service provider. An attacker is able to alter the content of the BGP table. An attacker announces the prefix of the (spoofed) victim to reroute traffic for the victim to itself. An attacker sends large amount of unexpected BGP traffic to the BGP router to expend hardware resources (CPU, memory). BGP route spoofing can be prevented using filtering based on prefixes and AS path. All filtering mechanisms specify only what you are willing to accept but not how much. A misconfigured BGP neighbor can send a huge number of prefixes, which can exhaust the memory of a router or overload the CPU (several Internet-wide incidents have already occurred). BGP maximum prefixes limiting is used to establish a hard limit on the number of prefixes received from a neighbor. It is enabled by default on Cisco IOS XR Software to impose limitations for different address families. BGP router terminates peering when a number of maximum prefixes is exceeded. Cisco IOS XR supports HMAC-SHA1 with key chains. To calculate a hash, part of an IP and an entire TCP header with data is used together with a pre-shared key. Every TCP segment is authenticated and the hash is prepended as TCP option 19. The hash is calculated on the receiving BGP router and compared with the received hash. LPTS policers are responsible for policing traffic to the RPs on the incoming line cards. Policer values can be changed for each line card separately. They can be used to rate-limit BGP traffic to the router. When a customer is under DDoS attack, the vast amount of traffic can also cause collateral damage to the infrastructure of the service provider. Once the attack has been detected, traffic related to the DDoS should be discarded on the edge of service provider network. The router signals over BGP to the edge routers that traffic causing DoS should be discarded. Traffic going to the IP addresses of the customer is discarded on the edge. Traffic coming from the IP addresses of the attacker is discarded on the edge. Uses strict uRPF with BGP signaling. Which RP to use from a set of candidate RPs in the RP set is determined by running the same hash algorithm on all PIMv2 routers. To configure the router to announce its candidancy as a bootstrap router (BSR), use the bsr candidate-bsr command in router pim configuration mode. To return to the default behavior, use the no form of this command. ip-address = IP address of the BSR router for the domain. For IPv4, this is an IP address in four-part dotted-decimal notation. For IPv6, the IP address is specified in hexadecimal format using 16-bit values between colons. hash-mask-len length = (Optional) Length of a mask that is to be used in the hash function. All groups with the same seed hash (correspond) to the same RP. For example, if this value is 24, only the first 24 bits of the group addresses matter. This fact allows you to get one RP for multiple groups. For IPv4 addresses, a value of 30 is recommended. The range is 0 to 32. For IPv6 addresses, a value of 126 is recommended. The range is 0 to 128.
priority value = (Optional) Priority of the candidate BSR. Range is 1 to 255. The BSR with the higher priority is recommended. If the priority values are the same, the router with the higher IP address is the BSR. When configuring PIM operations, the last-hop routers will never switch over to the shortest path tree and will always remain on the shared tree is the effect of setting the SPT threshold to infinity. 232.0.0.0/8 is multicast group range reserved for SSM. No MSDP SA messages within the SSM range are accepted, generated, or forwarded. MSDP establishes neighbor relationships with other MSDP peers using TCP port 639. On Cisco IOS, IOS-XE, and IOS-XR, the router can be configured to cache the SA messages to reduce the join latency. SA messages are used to advertise active sources in a domain. Use the show pim rpf command to display the RPF information for the RP or for the multicast source. To display information about reverse-path forwarding (RPF) in one or more routing tables within Protocol Independent Multicast (PIM), use the show pim rpf command in EXEC mode. vrf vrf-name = (Optional) Specifies a VPN routing and forwarding (VRF) instance. ipv4 = (Optional) Specifies IPv4 address prefixes. ipv6 = (Optional) Specifies IPv6 address prefixes. 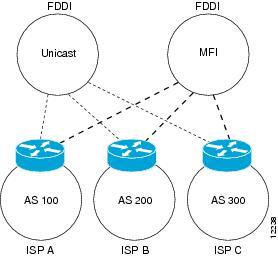 multicast = (Optional) Specifies a multicast secondary address family (SAFI). safi-all = (Optional) Specifies a secondary address family (SAFI) wildcard. unicast = (Optional) Specifies a unicast secondary address family (SAFI). topology = (Optional) Specifies the display of multitopology routing table information. table-name = Name of the specific multitopology table to show. all = Specifies that detailed information be displayed for all multitopology routing tables in PIM. IP address as defined in the Domain Name System (DNS) hosts table or with the domain IPv4 host in the format A.B.C.D. IP address as defined in the Domain Name System (DNS) hosts table or with the domain IPv6 host in the form of X:X::X. Note The ip-address argument can also be a Protocol Independent Multicast (PIM) rendezvous point (RP) address. Use the show mfib route command to display the (*,G) and (S,G) states information on the router. To display route entries in the Multicast Forwarding Information Base (MFIB) table, use the show mfib route command in EXEC mode. rate = (Optional) Displays individual (S, G) rates. statistics = (Optional) Displays both hardware and software forwarding statistics. * = (Optional) Displays shared tree entries. source-IP-address = (Optional) IP address or hostname of the multicast route source. Format is A.B.C.D or X:X::X.
group-IP-address = (Optional) IP address or hostname of the multicast group. Format is A.B.C.D or X:X::X. /prefix-length = (Optional) Group IP prefix length of the multicast group. A decimal value that indicates how many of the high-order contiguous bits of the address compose the prefix (the network portion of the address). Format is: A.B.C.D/length or X:X::X/length. A slash must precede the decimal value. detail = (Optional) Specifies detailed route information. old-output = (Optional) Displays the old show output - available for backward compatibility. summary = (Optional) Displays a brief list of the routing database. location node-id = (Optional) Specifies an MFIB designated node. The node-id argument is entered in the rack/slot/module notation. receivers on the Gi0/1, Gi0/2, Gi0/3 and Gi0/4 interfaces. the R1 router for it to be forwarded out the other interfaces. This command is used to enable NSF and is entered on the NSF-capable router, and also on any NSF-aware peer. the routing information with its BGP peers. disable = Prevents BFD settings from being inherited from the parent. ipv4 = Enables Intermediate System-to-Intermediate System (IS-IS) BFD detection of failures in the path between adjacent forwarding engines. Note The ipv4 keyword is available in IS-IS router configuration mode only. PIM triggered join and NSF/SSO features are used to provide high availability multicast. Triggered joins are sent when the primary or the secondary RPF information changes. No RPF change prunes are sent for MoFRR streams. commands for each address family. The af-group command is used to group address family-specific neighbor commands within an IPv4 or IPv6 address family. Neighbors that have the same address family configuration are able to use the address family group name for their address family-specific configuration. A neighbor inherits the configuration from an address family group by way of the use command. If a neighbor is configured to use an address family group, the neighbor will (by default) inherit the entire configuration from the address family group. However, a neighbor will not inherit all of the configuration from the address family group if items are explicitly configured for the neighbor. The session-group command allows to create a session group from which neighbors can inherit address family-independent configuration. A neighbor inherits the configuration from a session group by way of the use command. If a neighbor is configured to use a session group, the neighbor (by default) inherits the session group's entire configuration. A neighbor does not inherit all the configuration from a session group if a configuration is done directly on that neighbor. The neighbor-group command helps apply the same configuration to one or more neighbors. Neighbor groups can include session groups and address family groups. This additional flexibility can create a complete configuration for a neighbor. Once a neighbor group is configured, each neighbor can inherit the configuration through the use command. If a neighbor is configured to use a neighbor group, the neighbor (by default) inherits the neighbor group's entire BGP configuration. However, a neighbor will not inherit all of the configuration from the neighbor group if items are explicitly configured for the neighbor. In addition, some part of the neighbor group's configuration could be hidden if a session group or address family group was also being used. Refer to the Cisco IOS-XR configuration exhibit. The show ip bgp commands is used to display the contents of the BGP routing table. The output can be filtered to display entries for a specific prefix, prefix length, and prefixes injected through a prefix list, route map, or conditional advertisement. BGP table version = Internal version number of the table. This number is incremented whenever the table changes. local router ID = IP address of the router. s - The table entry is suppressed. d - The table entry is dampened. h - The table entry history. * - The table entry is valid. > - The table entry is the best entry to use for that network. i - The table entry was learned via an internal BGP (iBGP) session. r - The table entry is a RIB-failure. S - The table entry is stale. m - The table entry has multipath to use for that network. b - The table entry has backup path to use for that network. x - The table entry has best external route to use for the network. i - Entry originated from an Interior Gateway Protocol (IGP) and was advertised with a network router configuration command. e - Entry originated from an Exterior Gateway Protocol (EGP).
? - Origin of the path is not clear. Usually, this is a router that is redistributed into BGP from an IGP. Network = IP address of a network entity. Next Hop = IP address of the next system that is used when forwarding a packet to the destination network. An entry of 0.0.0.0 indicates that the router has some non-BGP routes to this network. Metric = If shown, the value of the interautonomous system metric. LocPrf = Local preference value as set with the set local-preference route-map configuration command. The default value is 100. Weight = Weight of the route as set via autonomous system filters. Path = Autonomous system paths to the destination network. There can be one entry in this field for each autonomous system in the path. (stale) = Indicates that the following path for the specified autonomous system is marked as "stale" during a graceful restart process. Use the show ip bgp neighbors command to display BGP and TCP connection information for neighbor sessions. For BGP, this includes detailed neighbor attribute, capability, path, and prefix information. For TCP, this includes statistics related to BGP neighbor session establishment and maintenance. Prefix activity is displayed based on the number of prefixes that are advertised and withdrawn. Policy denials display the number of routes that were advertised but then ignored based on the function or attribute that is displayed in the output. BGP neighbor = IP address of the BGP neighbor and its autonomous system number. remote AS = Autonomous system number of the neighbor. local AS 300 no-prepend (not shown in display) = Verifies that the local autonomous system number is not prepended to received external routes. This output supports the hiding of the local autonomous systems when migrating autonomous systems. The IBGP routing updates received by R3 from R2 will be propagated to the R6 router. The EBGP routing updates received by R1 from R5 will be propagated to the R2, R4, and R7 routers. The EBGP routing updates received by R3 from R6 will be propagated to the R2 and R4 routers. IBGP peer, the route reflector will then forward the IBGP updates to the EBGP peers and other clients only. Use the show ip mroute command to display information about mroute entries in the mroute table. The Cisco IOS software populates the multicast routing table by creating (S, G) entries from (*, G) entries. The asterisk (*) refers to all source addresses, the "S" refers to a single source address, and the "G" is the destination multicast group address. In creating (S, G) entries, the software uses the best path to that destination group found in the unicast routing table (that is, through Reverse Path Forwarding [RPF]). Use the clear ip mroute command to delete entries from the mroute table. Flags: = Provides information about the entry. D - Dense = Entry is operating in dense mode. S - Sparse = Entry is operating in sparse mode. C - Connected = A member of the multicast group is present on the directly connected interface. L - Local = The router itself is a member of the multicast group. P - Pruned = Route has been pruned. The Cisco IOS software keeps this information in case a downstream member wants to join the source. R - RP-bit set = Indicates that the (S, G) entry is pointing toward the rendezvous point (RP). The RP is typically a prune state along the shared tree for a particular source.